I've been asked a few times about how to get community members talking to each other, so I thought I'd share some ideas here. If you've had success in your community, and want to share you own tips, please comment! Use mentions to tag in other members (like Quora's ask to answer feature). If you think a specific member has the expertise to answer a question well, tag them in. This will also help surface that feature for your other members. Set up searchable interest fields (custom profile fields). If you make these public fields, your members will be able to use Advanced Search to find fellow members who have similar interests. Celebrate "wins" for peer to peer (Joe got his solution...). You can highlight these in a widget, or even add this type of information to your regular newsletter. Reward when people engage (use Recipes to kudo people who do it). Add points for commenting. Anything you incentivize will happen more often. Add social integrations to encourage external socializing. Enable as many of the social integrations as you can, so that your members can meet each other "off-community" as well. That may solidify relationships within the community. Hold an in-person event (use calendar w/RSVPs), then give everyone who attended extra points. Make private spaces to encourage self-disclosure (sometimes people are reluctant to share in the public spaces, especially if your community's subject area is sensitive). Use a survey to surface opportunities for folks to engage with each other (fun or business oriented). Quick surveys are a great way to offer a low-barrier entry point for discussion. It's easier to vote in a survey than to start a conversation yourself. Enable the recommendation engine, and it will recommend similar members. This allows your members to get to know each other too! What are your ideas and past successes with sparking peer-to-peer engagement? 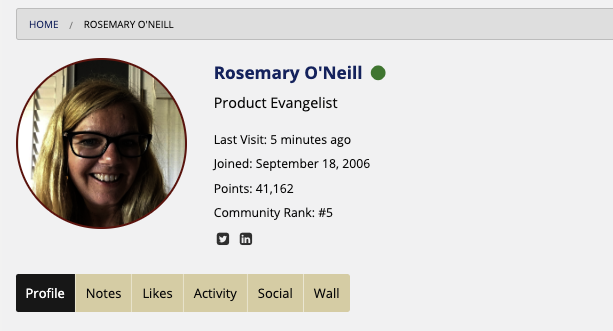 Would love to see some new Hoop features or tweaks to existing ones that glean and highlight “recent replies and new topics being discussed” in an attractive way so as to support the important goal you have written about, Rosemary. The block extracts don’t cut it. The Activity Stream tries but it’s too real-time and not descriptive. You don’t have to look far for what an enticing conversation boosting feature might look like. See Facebook. I have several ideas when you’re ready to brainstorm. Hi @Julie Usher, here's the announcement post about that feature, which gives some more detail: https://www.socialstrata.com/b...ecommendation-engine. If you want to pursue further, can you please put a support email in, so we can talk plan details, etc.? Hi @Cissy! The social integrations are enabled at the top community level in the control panel: Basics > Social Networks. For each social network, you can choose Sign-in, Member Profile Links, and/or Social Feed, depending on what's available to us from that social network (every API is different). If you choose member profile links or social feed as an option, your members will see a prompt banner at the top of their profile the next time they go that page, saying something like, "socialize your profile." It then allows them to authorize/authenticate any of those social networks to show up on their profile. See the tiny Twitter and LinkedIn icons in the screenshot below? That's how it looks when a member authorizes the social network "profile links." The "social feeds" show up in the Social tab on the profile (see the tabs in the screenshot above). Since this is enabled at the community level, it will appear on profiles across your site, including when you view profiles at the Group level. When you say, "Add social integrations to encourage external socializing. Enable as many of the social integrations as you can, so that your members can meet each other "off-community" as well. That may solidify relationships within the community," what do you mean? Linking Twitter and showing it on the site or what? Can that be done in communities and groups, or only on the main home site? Please advise (with links, for how, if possible).